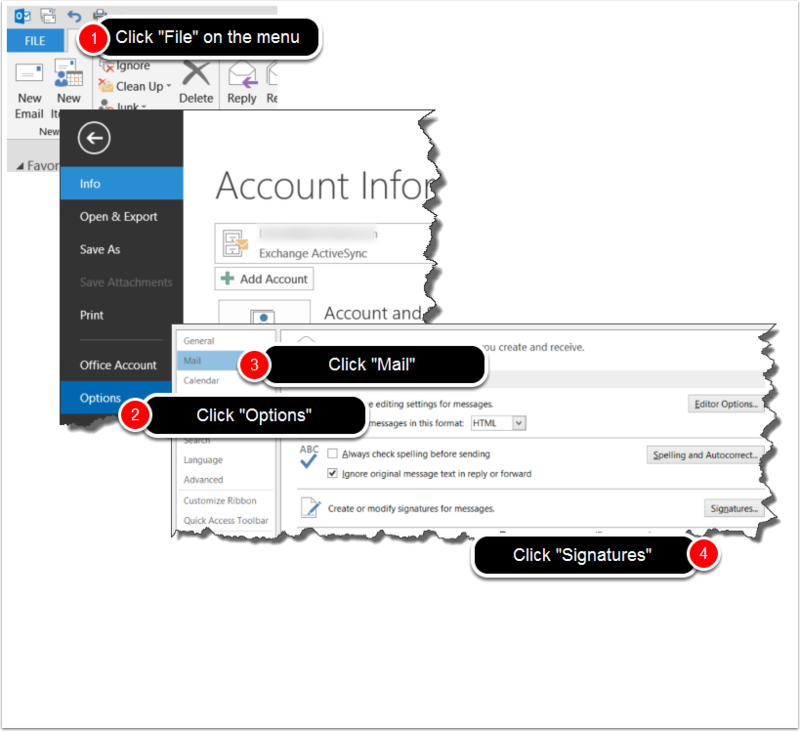 Creating a signature to be automatically applied to your Outlook email messages is a fairly simple process, although somewhat confusing the first time you go through it. The below steps will walk you through setting up a signature, but there are several things you should keep in mind as to how signatures can be used. Doing so will help you define how you want your signatures set up. Each of your email accounts can have its own signature. For example, you might have a signature set up for your personal email account, and a different one set up for your business email account. Each email account can have default signatures assigned, or the default can be blank so no signature is applied unless you specifically assign it. Each of your email accounts can have one signature default for new mesages, and a separate default signature for replies and forwards. 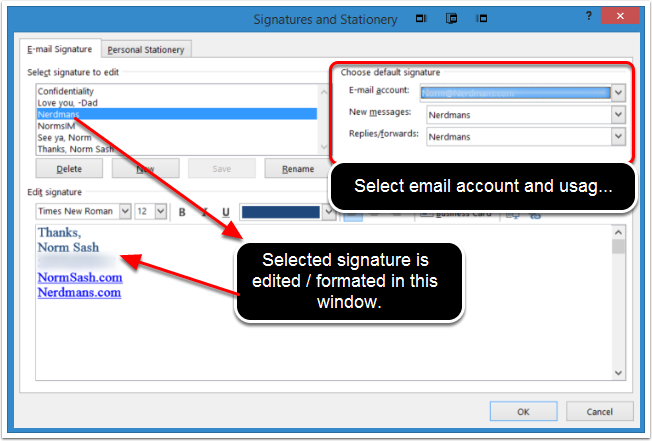 Regardless of the default signature assigned to an email account, you can select any of the available signatures and apply them to email messages at the time you are composing the email. 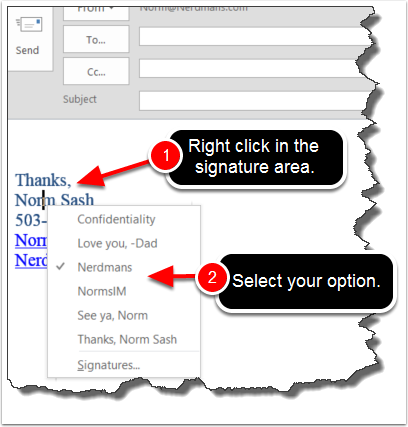 There are three methods of accessing your email signature settings (detailed below.) It doesn’t matter which one you use as they all take you to the same settings page. 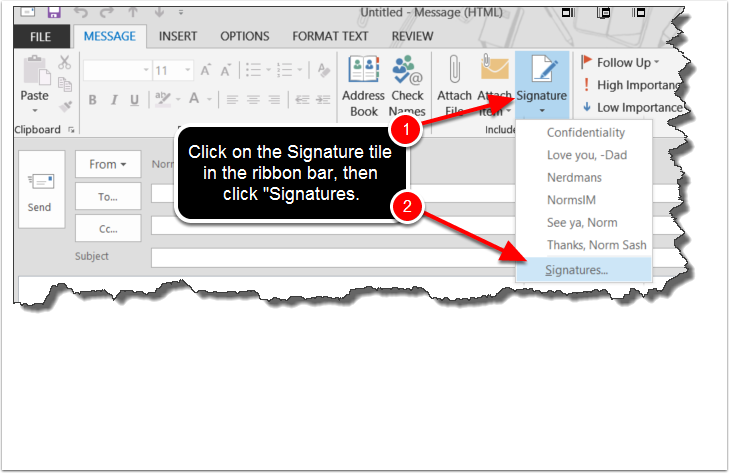 If you have an existing signature in the body of the email composition, you can right click on the signature and put a checkmark next to the signature you want to use, or click on "Signatures" to access the settings. Once you are in the signature settings you can select which signature you want to edit, format it, and then assign it to an email account and usage.